Having graduated from Wheelock College with a degree in Early Childhood, you are currently working as a Senior Teacher in a childcare centre and having the primary role of caring and managing toddlers. You have been with the centre for about a year. (a) What would you reveal to Mrs Kong regarding your professional view about children with Down Syndrome and their future in Singapore? (ii) Nicky's diagnosis of having Down Syndrome. 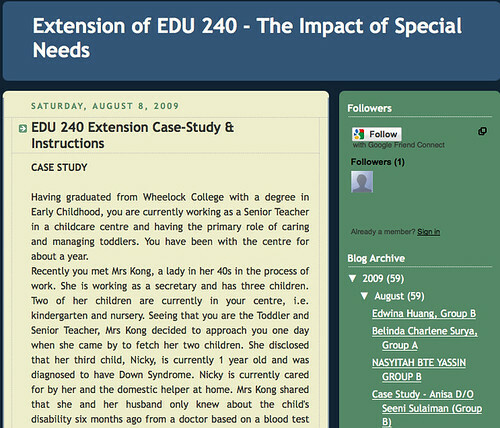 (c) What would you disclose to Mrs Kong about special education, special school and inclusive education in Singapore? As a layperson, reading that case study and the accompanying responses was pretty educational. The case study is fairly detailed and highlights what parents of children with Special Needs might be going through. Sharing the various responses is also a good way of tapping on the "wisdom of the class". I'm interested in what a "model response" might be. I didn't read though all the posts. But seemed to me most responses adopted the classic "pyramid" approach of giving background info before giving the actual answer that the other person wants to know. Some chose the empathy/ reassurance approach. That is still an indirect answer to me. None of what I've read seems to have addressed the crux of the question: "Do I -- the Special Needs educator -- feel children with Down Syndrome have a future in Singapore?" In fact, the main clue in the case seems to be this sentence: "Mrs Kong is very confused and overwhelmed with all these information." The last thing Mrs. Kong needs is more information. Her concerns needs to be addressed directly (tactfully, but head-on). Seems to me this question is a trick question: "What would you reveal to Mrs Kong regarding your professional view about children with Down Syndrome and their future in Singapore?" It boils down to what the individual Special Needs Educator believes. Seems to me there can only be one answer (the difference is how it's phrased according to one's style). Children with Down Syndrome have a future in Singapore. That is why I am a Special Needs educator. I felt this was a trick question because it has nothing to do with facts or figures. It's all about one's personal conviction about one's own work. Whether we believe in the work that we do. Of course, I'll back up my statements by citing examples. Like how the Singapore government has recognised the need to take proactive steps wrt persons and young children with special needs, and many things have been put in place since the "Enabling Masterplan 2007-2011". Will also qualify that every individual's future is different. Even more so for a child with Down Syndrome. That's where parental acceptance and support, working with the system, comes in. But all that's just background information. It's ultimately that look in the eye -- that surety in one's voice -- that will say it all to parents like Mrs Kong. It's not about bluster. Or how loud you say it. I think it can only comes with one own's rationalisation and decision to continue with the job. You can't fake that sort of conviction. And the same level of conviction applies to any job.